Midnight Back home from yet another Web 2.0 Mashuppy, BarCampy, Un-conference. Check feeds, (web not baby’s.) Then, at last; Bed. 4.00am Quick look in on Facebook, Twitter and LinkedIn on way to loo. 4.30am Go back to bed, (forgot to go to loo). 7.00am Up and at ‘em. Check my LinkedIn account: 2 business leads in 3 years. This site is incredible. W00t! w00t! 10.10am Re-check my Twitter feed. Read 279 tweets before I find anything remotely interesting. So it's such a relief to know that a woman I've never met in Bromsgrove has just had her second lovely cup of coffee, is now writing emails, has cryptically given the answer to a question one person asked, but that every other one of her 1,123 followers weren’t privy to, and has posted a 'great' link via tinyurl that doesn't give anyone the foggiest inclination about what it might be for. Fantastic stuff! Why aren't more clients and their staff using this essential productivity tool. Amazing. 11.20am Spend 2 hours watching Seesmic p2p videos. How I love this cutting edge liberating technology. No matter that most of the content is rambling, inane, unedited nonsense shot on poor-quality, built-in laptop cameras in low light and delivered by often unwatchably shabby conversion. Decide to overlook this and tell myself; 'see the bigger picture man.' Anything goes in Web 2.0. There are no rules. Viva Che! Rock! And roll. 11.45am Now I got to log onto Qik, pronto, to see some similarly, unscripted, unedited, production-values be damned, user-generated tosh that is "revolutionising" our industry. Why, oh why, oh why, oh why aren't more clients using this essential productivity tool? Way to go cam-heads! Noon Withdrawal symptoms. Really need to check my twitter feed again. 3.30pm SMS myself reminder to use a lot of their insights in my next client presentation, with additional note to self to remember to forget to credit them and put my own Bearded Prophet Copyright symbol on all quotes used. 4.00pm What a day! Knackered. Curl up in a ball under my desk and wait until it’s time to go to the pub. Keep my 5G iPhone handy though. (iJailbreak, I love you.) Dream about how social media rocks and advertising is dead. 5.55pm Woken up by my Boss, the youthful, urbane, unflappable, cultured, drop-dead gorgeous Mike Coulter, founder of DigitalAgency.com He asks me into the boardroom. He fires me. He tells me I'm a non-essential, non-productive, Web 2.0 tool. Alas I shall miss the prophet, although I have a feeling it can't last long, you'll beg him back soon enough. You'll miss his sheep throwing, twittering, photo posting, self-promoting ways. Are you really ready to give up the daily search for that elusive hit? Surely someone who quotes Edwyn Collins in their brief bio is worth spending time with? Tattoo-me-Keith would've done a much more efficient job than that old DeadHead. Probably see him soon with his dog and a paper cup on Princes Street. Maybe even with two dogs. A tour de force, Uncle Michael Not so much self-deprecating humour as self-eviscerating. 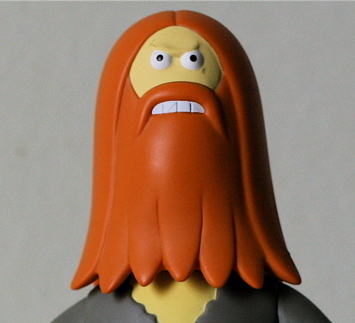 Oh, and Mr Prophet looks strangely like Lee Clow, if you ask me. Hope you hung on to that 5G iPhone before you lobbed him out of the office?